Family sagas are definitely my jam, and this novel was no exception. I enjoyed the structure of the book, working backwards from the arrival of estranged son Amar at the daughter Hadia's wedding. Immediately we know that something is amiss and are not given the answers as Mirza quickly brings us back in time to the beginnings of their family, their parents marriage, and examines the childhood of the three siblings. I felt invested in the characters right away, as they struggled with universal experiences of childhood - most notably: first love. Learning about different cultures also makes a novel compelling for me, especially in the ways it affects the family dynamic. There is a lot to unpack about gender roles, religion, habit and individuality. "Maybe it was the exceptions that we made for one another that brought God more pride than we we stood firm, maybe His heart opened when His creations opened their hearts to one another..."
The second part of the book brings us back to the wedding when all of the family secrets come out and it plays out in excruciatingly dramatic fashion. I turned the pages furiously, hoping the characters I had become invested in had some closure or perchance a happy ending or two. "And remember that any time you point your finger to accuse someone, there are three fingers beneath it, curled to point right back at you." In the last section, we are given the Rafiq's, the father's, story as he reflects on the entire history of his family from his devastating point of view. Mirza's writing is simple and beautiful, evocative of first loves, unrequited love, familial and, in the end, excruciating parental love. If you enjoyed Everything I Never Told You by Celeste Ng, I would HIGHLY recommend this book. There are so many similarities, and the common thread of a minority family struggling with the love they have for each other, their culture, and trying to do right by one another. Sometimes their actions end in happiness, and other times it ends in tragedy, as in life. Many thanks to Hogharth books and NetGalley for the free advance digital copy for my review! I've heard mixed reactions about this book but your review has tipped me into the 'need to read' category. Especially with the Everything I Never Told You reference. I loved that book. GAH! I somehow wasn't getting comment notifications from blogger :((( Sorry for the late response, Sarah, let us know if you pick it back up! It's so nice to hear your thoughts on A Place for Us because it was also a DNF for me. It just seemed so slow to me and I went back to it several times before finally putting it aside. I did finish Everything I Never Told You, but didn't love it the way so many others did. 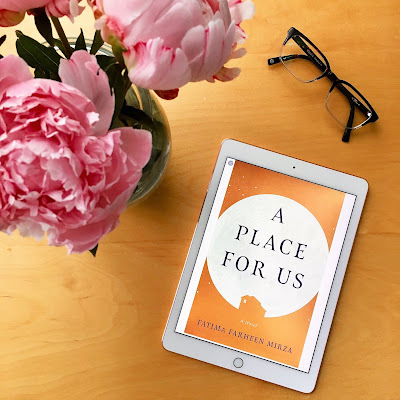 Your comparison of the two books gives me a little context for why A Place for Us Just wasn't working for me.